Scores from the it was actually a very nice day to ride, bike tour. Leaving Syracuse in rush hour: Perilous, do not attempt this alone. A sunny day: What a treat. Riding along the Erie Canal: Nice, very nice. Visiting a fire station with Willie: Rewarding. Willie is raising money for FAAN - Food Allergy & Anaphylaxis. He visits first responders, Police and Fire, and thanks them for their help. 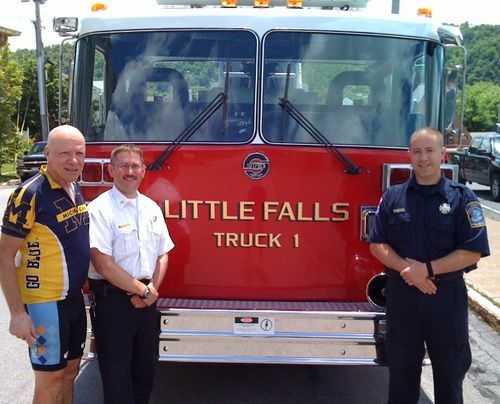 I went with him to the Little Falls FD today. Well done Willie. Disappointment: Not only did Nancy not ride today but Chris as well. He took a standing fall a few days back and injured tendons in his leg. He had ridden EFI--Every Freaking Inch until today but had trouble walking. Biking aggravated the injury. Hang in there big guy. Tracey: She is the organizer of this tour and does a fabulous job. She went to the ER today. She injured her back and apparently reacted poorly to the pain pills. Riding in the East: Not nearly as safe as the West. More traffic, roads that have been through winters, cities. Question: What is it with men sitting in their garage on lawn chairs? We have seen a lot of this lately. Just a sittin and a starren. Little know fact: Little Falls is on the Mohawk River. It is the second largest falls of the Mohawk. I left the hotel a little late and my normal riding partners were up the road. When I realized we were in dangerous rush hour traffic I decided I should try to catch them. I hammered until I caught them. What a relieve. Dealing with expressway on and off traffic is not to be done alone. A group of four has a presence that is helpful. Jim lives in LA and Peter in NYC and they have the experience to deal with these situations. Willie was with them and we rode hard today arriving in Little Falls at 12:15. After leaving Syracuse it was a nice ride, good weather, rolling hills, the Erie canal, scenic rivers and mountains. Tomorrow 70 miles to Albany, wind out of the NNE. Scenic ride through the Adriondacks. They put six foot flags on their fire hydrants to be able to find them in the winter. There are people that actually live here. Three letters about the guys on the lawn chairs - CWD. Al - this was part of the ride I was telling you about. There is this big old factory type building in Herkimer that overlooks the valley that is really pretty. Your route is along Rte 90 and it's really pretty along the river. Call my brother Rich in Albany and maybe he'll take you golfing. Almost done - enjoy the last few days. men sit outside because otherwise they would have to sit in with their wives and watch soaps--so they keep guard outside! today you will ride to the area where my dad's family is from-then on to Vt. Grabrielle was born in Brattoboro Vt.
Glad to hear about a good day ... relatively speaking, at least for you, on this trip. Okay, so we're biased that you're not on the casualty list. Scary attrition - good thing there's only 3 days left of serious riding. Ann Arbor Summer Festival is on and rocking. Have ushered at some great shows, and folks look like they're having fun in front of Rackham. Stay healthy and you'll be back in time for some different kind of fun. Carol hopes you'll share some pics and stories ... we could sell tickets. I suggest you do what I do when I get a flat. Call AAA. It works very nicely.